Have you ever been at a loss for words during an important conversation or recalled a prior conversation wishing you could have conveyed your message more effectively? Do you wish to improve your communication skills and quickly build rapport with strangers, peers, superiors or even customers? 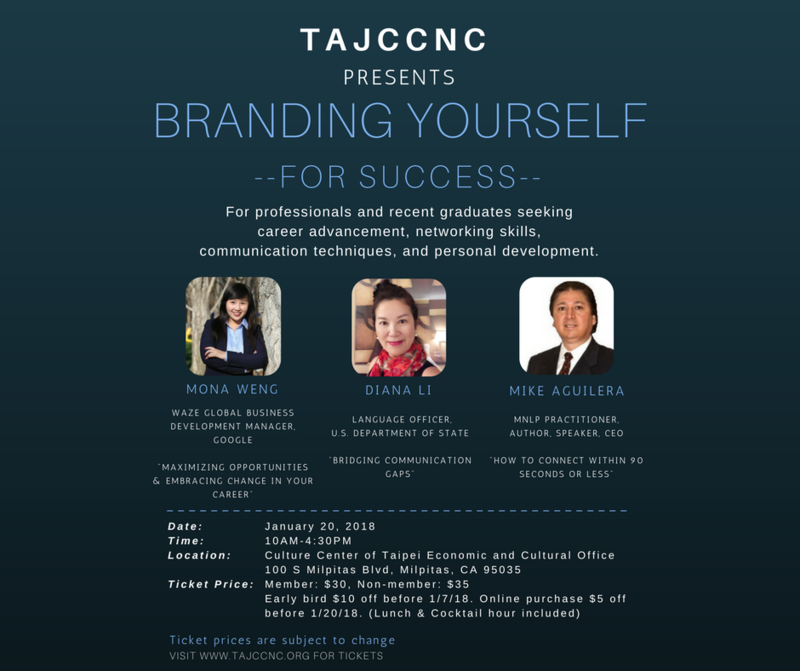 “Branding Yourself for Success” is the first in a series of self-improvement seminars, tailored to professionals and recent graduates, just like you, seeking career advancement, networking skills, communication techniques, and personal development. Your attendance is sure to empower you with a clear mindset and valuable skillsets to achieve your communication goals. "Maximizing Opportunities & Embracing Change in Your Career"
Mona Weng is Waze's Head of Business Development for Asia Pacific as well as Global Lead for Waze's Broadcasters Program. Owned by Google Inc, Waze is the social navigation pioneer, leveraging mobile technology and a passionate global community to redefine expectations of today’s maps. Prior to Waze, Mona led Google’s US mid-market event marketing efforts, and consulted over 1000+ SMBs & startups on digital marketing. Mona is an alumni of UC Berkeley with exchange experience at National Taiwan University & University of Hong Kong. In this seminar, Mona will share her experience on finding her career path, creating a strong personal brand, and how mentorship programs have helped her on her journey. "How to Connect Within 90 Seconds or Less"
Early Bird $10 Discount before 1/7/18. Online Purchase $5 Discount before 1/20/18. Event Admission + New Membership Enrollment Special Combo Price Available! *Ticket includes lunch bento box and one drink at the cocktail bar and are non-refundable. Join us in learning about these highly beneficial topics and immediately implement your newly learned techniques during the cocktail hour. You will definitely have an engaging and fun experience and never approach communication the same way again.